The Renaissance consisted of vast cultural and intellectual changes that began in the Italian city-states in the 1300's and later spread throughout northern Europe. 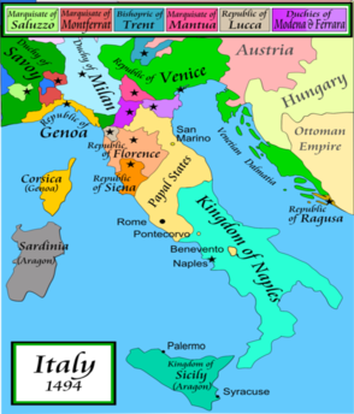 Trade stimulated by the Crusades had made several of the city-states wealthy, such as Venice, Genoa, and Florence. Wealthy families, such as the Medici in Florence, became patrons of the arts, encouraging and supporting such geniuses as Leonardo da Vinci and Michelangelo. Some of the biggest supporters of Renaissance art and sculpture were the Catholic Popes, who commissioned work for the Vatican and St. Peter's cathedral in Rome. The era also saw a revival of interest in reading, writing, architecture, and philosophy. 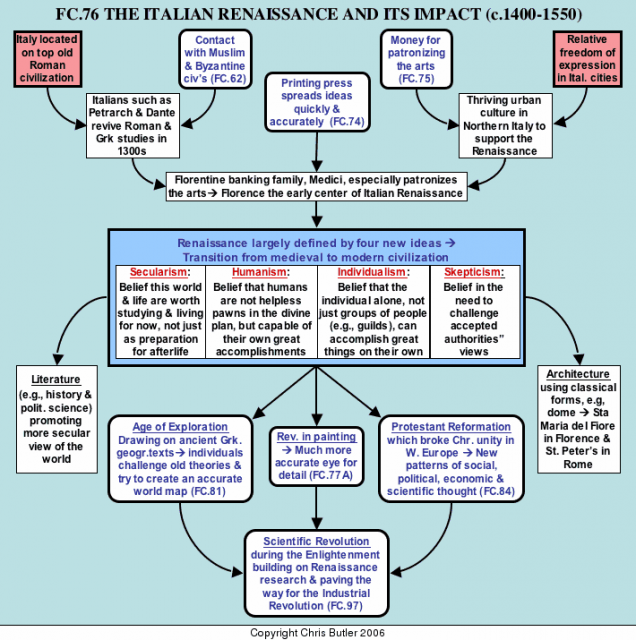 Without the patrons' wealth, the Italian Renaissance would have been impossible, but it almost certainly was stimulated by contact with the more sophisticated civilizations of the Middle East and south and east Asia. 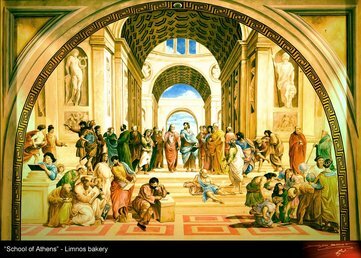 The Renaissance, or "rebirth" was characterized by an attempt to revive the values of the classical civilizations of the Mediterranean, Greece and Rome. Although most of the major Renaissance figures did not actively defy the church, they put emphasis on other aspects of life than the religious. An important philosophical influence restored from ancient civilizations was humanism, which focused on the accomplishments, characteristics, and capabilities of humans, not of God. Humanism is reflected in Renaissance art, with newly skilled artists showing individual differences in faces and beautiful examples of human physiques. The Renaissance spread from Italy north, and by the 16th century had inspired new art styles in the Netherlands and Germany, as well as such literary geniuses as William Shakespeare in England. The importance of the European Renaissance goes far beyond art and literature because it encouraged people to think in different ways than they had before, a quality that Europeans would need as they ventured in science, technology, and eventually across the Atlantic to the Americas. When the humanism of the Renaissance spread to northern Europe it combined with Christianity to form Christian humanism. Remember that humanists distrusted the traditions handed down to them from the Middle Ages and wanted to examine the sources directly for themselves. It was in this spirit of Christian humanism that Martin Luther called into question the traditions of the Roman Catholic Church and went to the original source (the Bible) to see where he thought the Church went wrong. In the early 1500s many Catholics recognized the need to reform the Church. Many bishops got rich off of their people. It was not uncommon for priests to kept concubines around. Priests were exempt from taxes. People resented this the most when there were famines. And if a clergy committed a crime they did not have to go to a secular court but a church court in which punishments were not harsh at all. The Church routinely used the power of excommunication to threaten people. There was a push or urge for a reform in the Roman Catholic Church and there was an intense desire amongst the people for a reform. One important follower of Luther was John Calvin. Calvin believed that God chose all the people who would go to heaven long before anyone was ever born. This belief is called predestination. The Catholic Church believed Luther was wrong. They argued that if any Christian can interpret the Bible anyway he wanted to, Christianity would constantly split up into many groups who do not see the Bible in the same way. They were right. In the 1520 a group of peasants revolted against their lords in the name of Luther. They claimed that since he said all are equal before God we must also be equal before men. 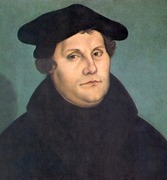 Luther denounced the revolt and urged government leaders to put it down at any cost. 100,000 of them died. 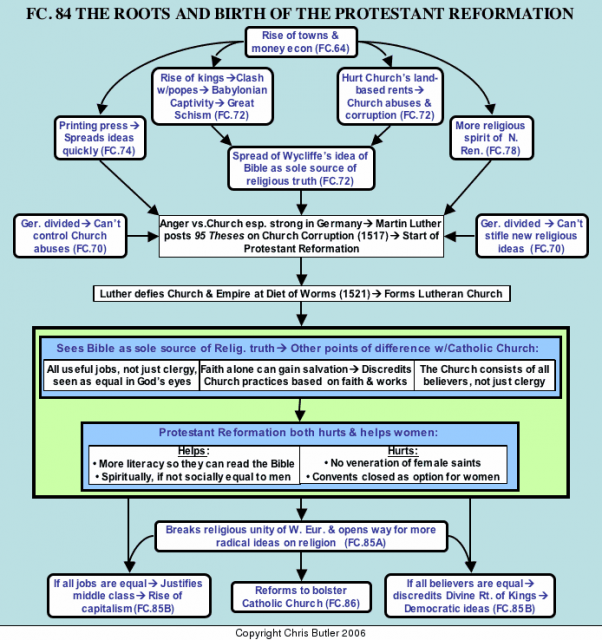 This shows that Luther did not want his ideas to bring any major change to society or politics. One group of Protestants was furious at how the peasants were treated. Because they believed than only adults should get baptized they were called Anabaptists. They baptized adults (not infants). Another important distinction about the Anabaptist was their distrust of government. After seeing Luther side with the German princes in the peasant revolt, they began to advocate a separation of government from religion. Their modern descendants remain very suspicious of government.